Well, I have to admit, generally “palette wood projects” make me roll my eyes, I mean, at the end of the day new wood isn’t that expensive. 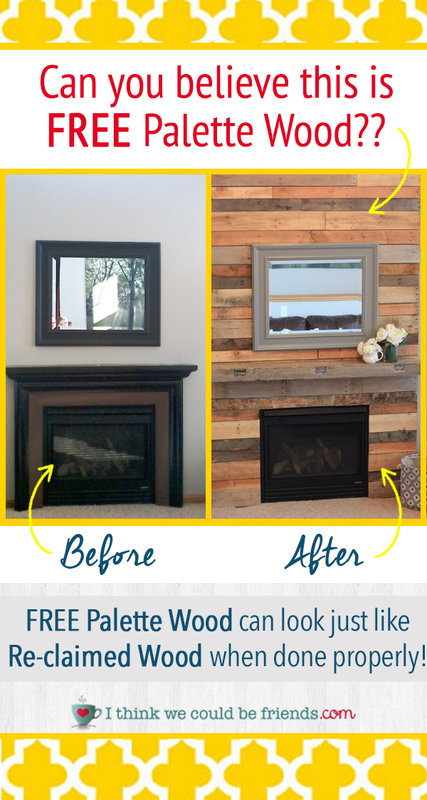 But as we searched for an inexpensive way to makeover our fireplace, I was surprised to see how palette wood could very closely resemble re-claimed wood when done correctly. What I also appreciated about these designs is that they don’t look too “country” or like they only belong in a cabin. I love the texture and warmth that the wood adds (especially the warmer toned woods below), but didn’t want to lose the contemporary style of our house. 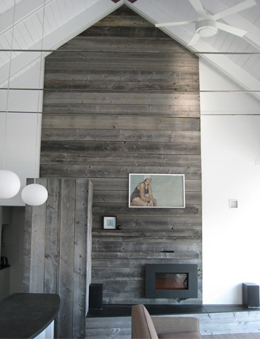 And, even if you don’t have a fireplace to re-do, this technique looks great for a feature wall or hardboard like below. So, with these ideas in mind, we decided to give it a try (we really didn’t have much to lose!) and set out to find some palettes. In most areas if you just check Craigslist you will find companies giving them away. We had no problem collecting the palettes and specifically looked for a mixture of new and old, and ones with different sizes of boards. Oh it’s not the worst thing that you have ever seen, but what you can’t really tell from the pictures is that it was actually a faux stone that the previous owners painted. We thought about re-painting it, but with the traditional styling of it, even with a coat of paint we didn’t know that we could get it to match our aesthetic. 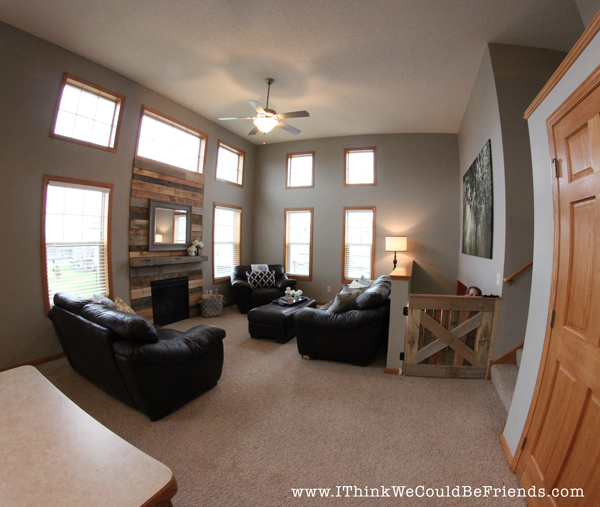 Plus, with the super high ceilings in this section of our house, we really wanted something that filled the space more adequately. The only other slight snag we ran into was that the carpet was actually cut out around the old surround so there would be a little patching to do (likely from a bedroom closet) when the project was done. Once we got back home, my husband used a Sawz-all to cut through the nails to separate the boards. When all of the boards were in individual pieces, we laid them out on the garage floor. Preparing the boards was the most time-consuming part of the project, but once they were laid out on the garage floor, the project went really quickly! >> The boards didn’t line up perfectly, there are some small gaps between the boards, but you don’t notice, a great part of this project, it doesn’t have to be perfect! Ta-Da! 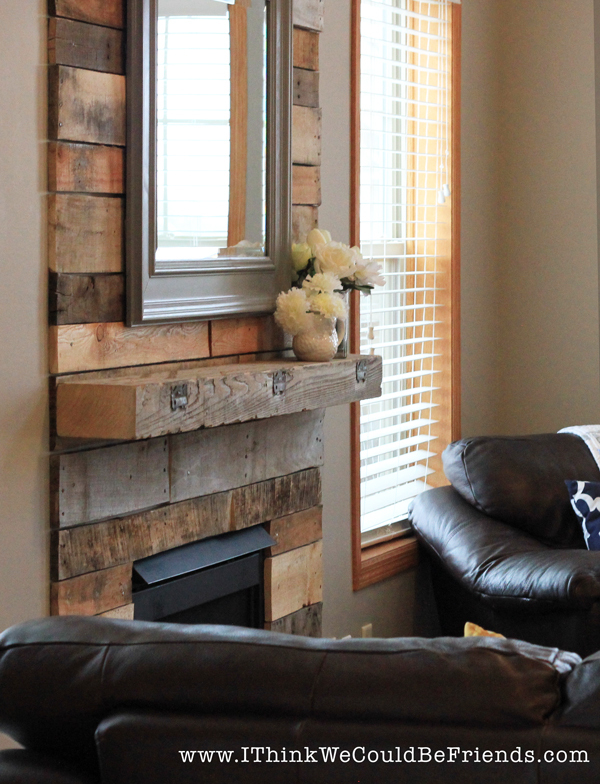 Our Faux Re-claimed wood Palette wood Fireplace surround! I love, love, love the final product! 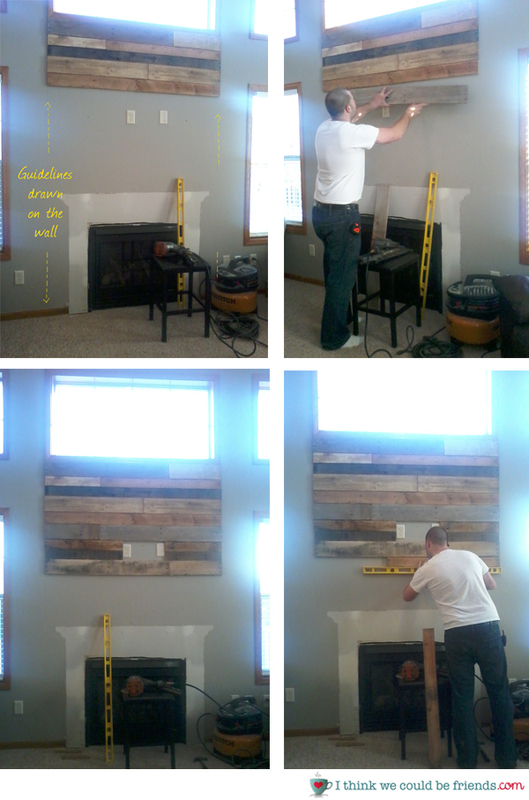 Originally this project appealed to my frugal-ness…I didn’t want to spend a lot on re-doing our fireplace since this isn’t our “forever-home”, but it turned out much better than I could have imagined! I love the warmth that it adds to our main level, you just want to sit in there with a cup of coffee and chat. 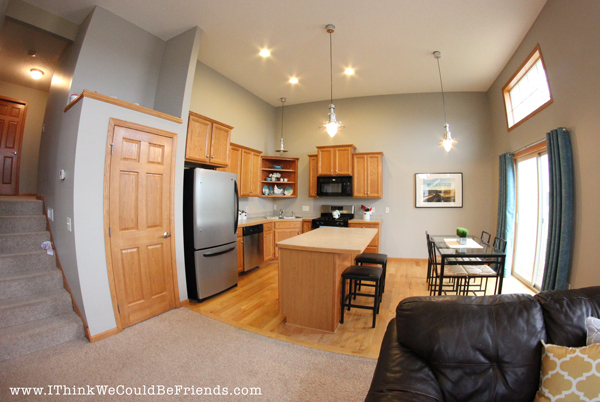 I also like how well the different colors and tones in the wood go with our existing oak molding. For the mantle we were fortunate to find an old timber from a dismantled building at my parent’s farm. It even had some old metal brackets on it that made it even more interesting. We like the simple lines of it since again, we were going for a more contemporary look. I also didn’t want anything too big, I knew I would be putting small things on it, because the room, while it has tall ceilings, is actually pretty small. >> Featured Question: How important is it for my kids to fit-in at school? I have a gas fireplace that looks similar to yours and just built floor to ceiling built-ins (my first ever real wood project!) 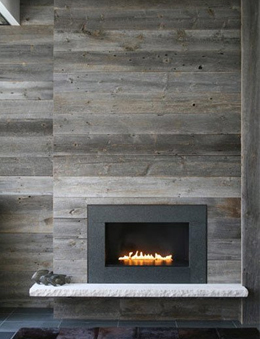 on either side of it and was thinking of doing slate drystack floor to ceiling for the fireplace between the built/ins, but not only is this BEAUTIFUL and way cheaper than the stone, it would also be easier for me to do (I do not have a wet saw for the stone!) 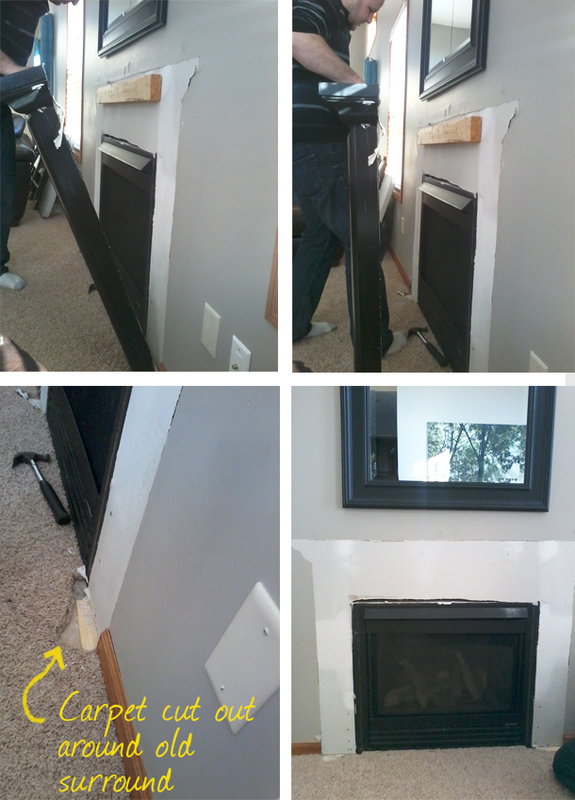 However, I am wondering about the wood being that close to the gas fireplace. WOuld it get hot enough to cause a fire? 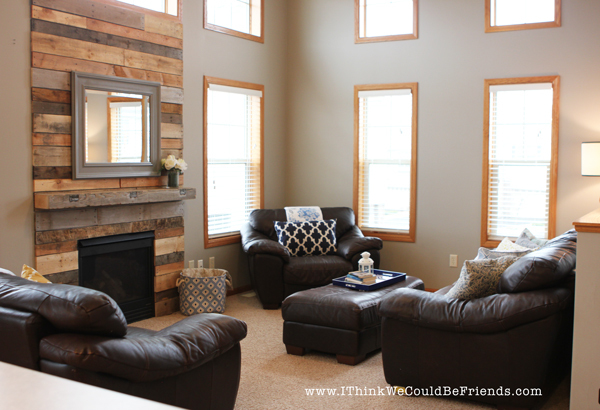 Is pallet wood really safe to use around a surround like that? Did you guys research it prior to beginning and if so, what were some of the websites you checked out on the matter? I want to make sure I don’t do something dangerous! Thanks! Great questions! We thought of that after we completed our project…we don’t really use our fireplace because of the kids, so we were just going for aesthetic. My husband wasn’t too worried about it, but, with that being said, we are not qualified to give that kind of advice! wow!! i am sure it’s been said above but WOW!! amazing and I love it!! I am thinking our new back porch will need a heater….which will need something around it to protect it right!?!? WOW!! 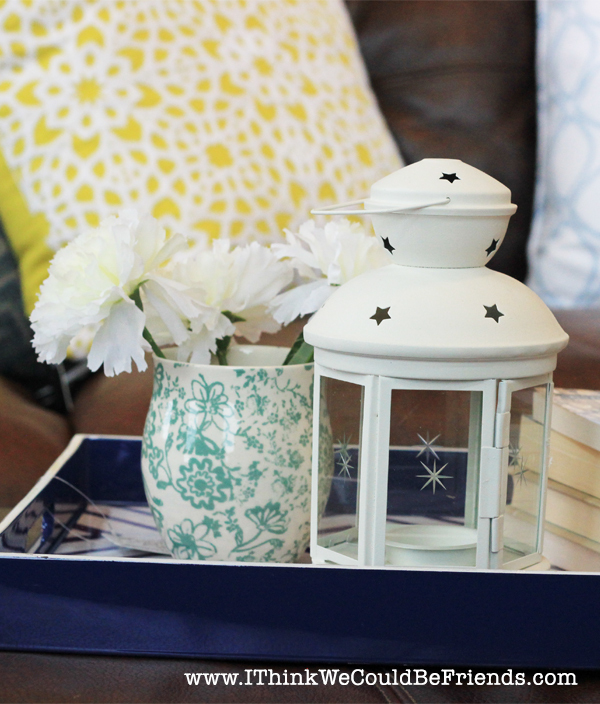 thanks for sharing with us at the creative challenge upcycle party! Looks great but not sure it is code compliant. Is your fireplace gas? If so I do believe that there are restrictions with the fire code on wood being so close to the heat source. But that may not apply in your area? But people who may want to reproduce this look should verify with their codes. I love, love, love this! You guys did a wonderful job on in! I want if for my house, but I have a brick fireplace Darn it! 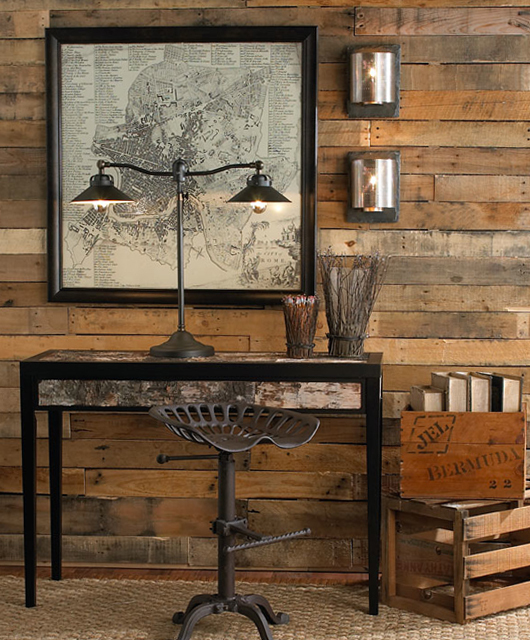 Such a great feature in your whole room–great job! Pinned and featuring tomorrow at Bacon Time party! Absolutely stunning! 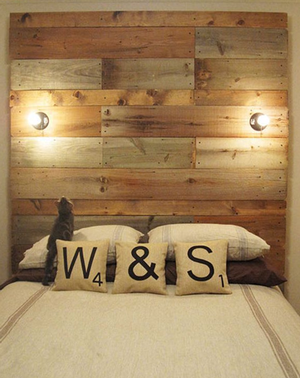 I have been dying to do a headboard like this! Great job. Thanks so much for stopping by the Creative Spark Link Party hope you stop by again next Wednesday. Your fireplace is gorgeous. I love the transformation. Thanks you for sharing at Project Pin-it Thursdays. 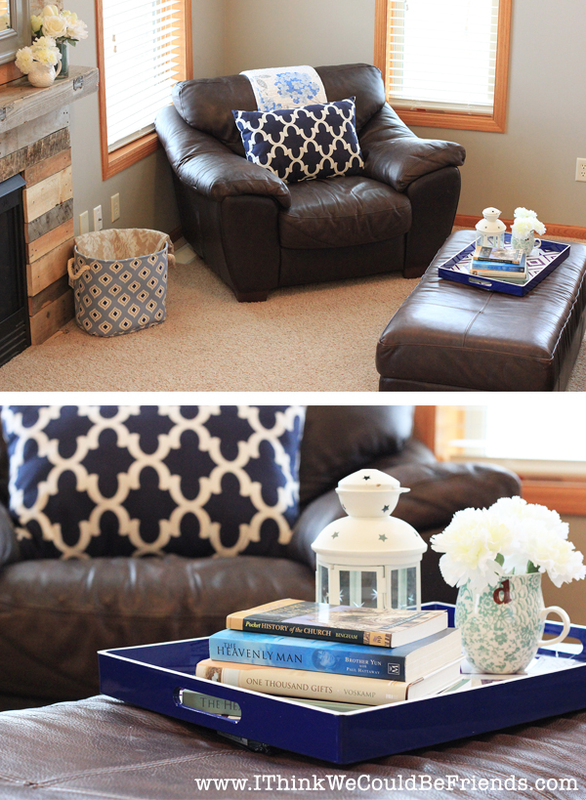 Stopping by to let you know I am featuring your fireplace tomorrow! Thanks for joining the Perpetual Party Board! I love the new look. And, I desperately want that room with all the windows! Thanks for sharing your awesome fireplace with us at Motivation Monday! Saw this at Time to Sparkle – Love it, Got it Pinned!! The fireplace surround is lovely! Such a great project! Thanks for sharing! 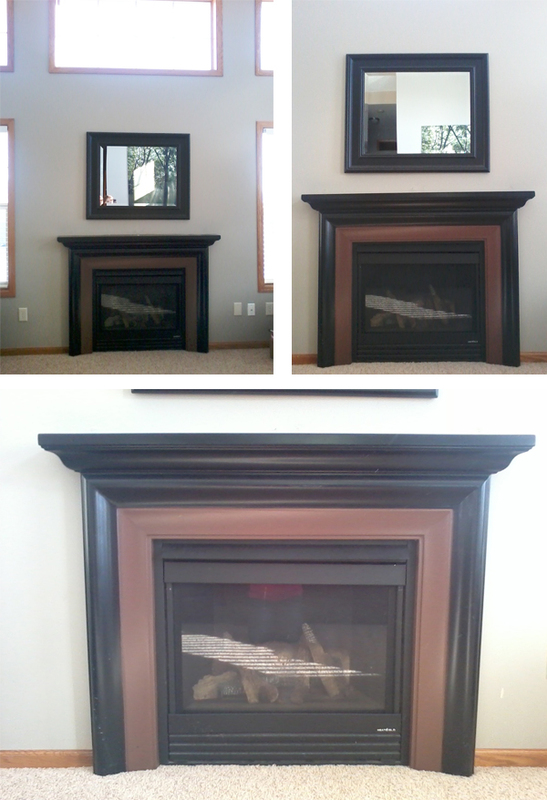 Dawn, wow great job on the stunning focaloint you created for the room, love it, what did you use for the mantle piece? Was the wood used as found or did you add the metal hinges for effect? Wonderful transformation ! Thank you! 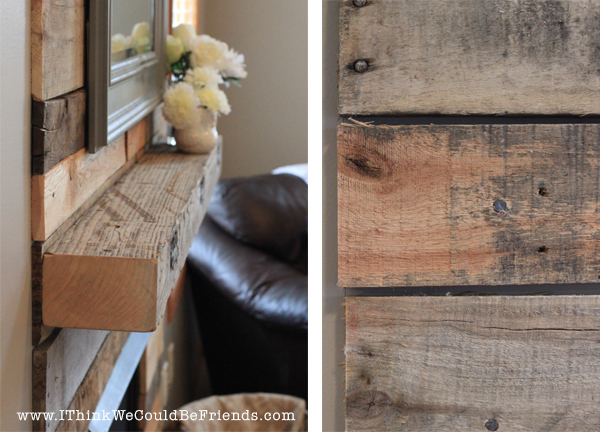 The mantle is actually a piece of reclaimed wood from my parent’s farm. 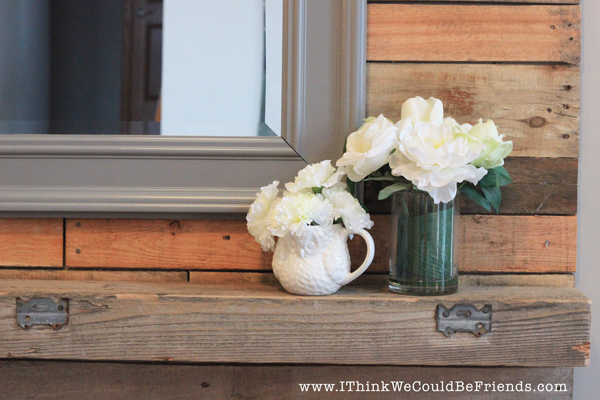 We weren’t quite sure what we were going to use and thought we may have to purchase an old mantle, but when we came across this it seemed perfect, and the metal pieces were already on it :) I may look for some old/antique metal shelf brackets to put below it down the road. Wow! What a huge difference. It really is stunning! Well done! This fireplace looks absolutely fantastic. You should be proud. Looks fantastic! I would love it if you joined and contribute your awesome posts at my link party at City of Creative Dreams on Fridays :D Hope to see you there at City of Creative Dreams Link Party. Thanks for sharing. Will pin it to my Pallet Board. I would love it if you considered linking up on my party. This is beautiful, I adore how this came out. I too am trying to change up my builders standard home one DIY project at a time. It is a lot of work, but I am so proud of the unique feel to it all. 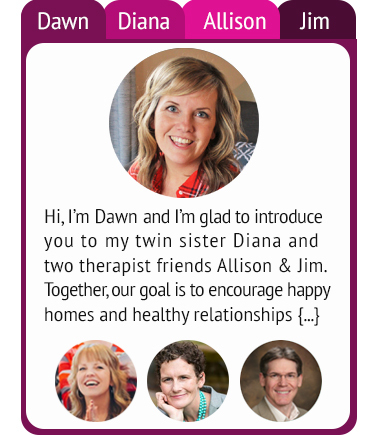 Just found your blog and am loving it! Stopping by from the Work it Wednesday party, and just wanted to say that your fireplace looks great! We are thinking of doing something similar in our kitchen, so I love seeing how fabulous it can look! What a beautiful fireplace!! This gives me so much inspiration! !